Japanese band, noodles, just released a new album ‘I’m not chic’ with this awesome album cover artwork by Yoshitomo Nara. Yep, I’m so not chic. Notre Dame, the morning after the fire. Love this - So Inagawa’a remix of mouse on the keys’ track, ‘Stars Down’, featuring Dominique Fils-Aime. Yes - whether it’s actual poetry, a way of seeing the world, or a way to reach out to others on the street - we could do with some more poetry in the world. 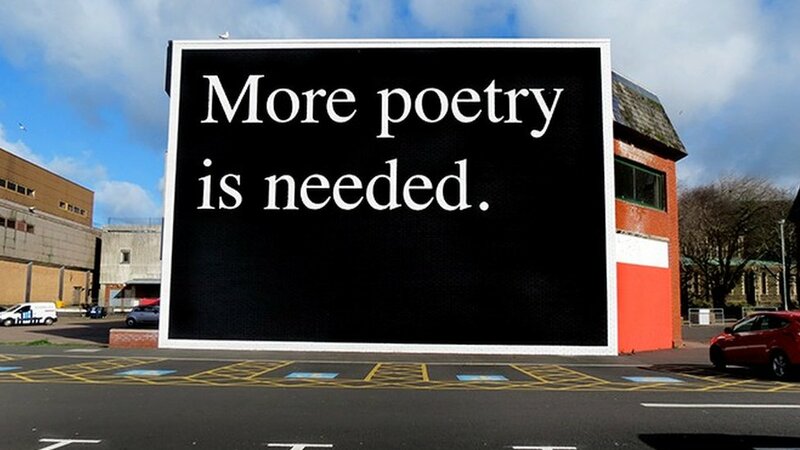 British artist Jeremy Deller’s billboard pasting was created in 2014 on a large wall of Swansea’s Quadrant Shopping Centre, UK. It was commissioned as part of a celebration of the centenary of poet Dylan Thomas’ birth. The beauty of street art – its life is shaped by the street. It might get pasted or painted over, tagged, torn down, hosed off, collapsed with a building, get worn by the elements, or it might last for a very long time. Artist JR knows this. To celebrate 30 years of the Louvre pyramid designed by architect I.M. Pei, he created alongside 400 volunteers, an optical illusion paste-up on a massive scale called, ‘The Secret Garden of the Pyramid’. Made from 2000 sheets of recycled printed paper, the paste-up/collage provides a fantastical glimpse of what lies beneath the pyramid, as if the structure is emerging from an archaeological dig. Over the 3 days it has been visible the artwork has gradually been abraded by foot traffic and visitors tearing pieces away to take home as souvenirs. It was never meant to last. JR believes as a living artist, his artwork needs to be alive – to have a life of its own – which stands in stark contrast to the surrounding Louvre museum where artworks are collected and looked after in perpetuity. It was never meant to last, and that’s the beauty of this artwork. It’s #worldpoetryday, and while I’m not big on what feels like an arbitrary custom to highlight something for a day – like #worldenvironmentday should be every day, and pretty much any other cause that’s significant – here’s some poetry that goes beyond words: Icy and Sot’s installation, ‘imagine a world without borders’. Originally from Tabriz, Iran, the sibling artists started out stencilling on the streets of their home city and now live in New York, making work in a variety of mediums internationally. Engaging with issues such as gun violence, the refugee crisis, human rights, and climate justice, the duo’s public art has an underlying purpose to advocate freedom and hope for people worldwide, and raise awareness in issues relevant to our times. Eloquent art work by Pejac (@pejac_art), ‘From Yin to Yang’. JR’s (@jr)) fantastic tribute to an epic person - Greta Thunberg (@gretathunberg). Strike for Climate - internationally today! Sean Yoro’s (@the_hula) next art project goes deep underwater. Wanting to make a difference to the degradation of coral reefs due to climate change and pollution, Yoro’s “Deep Seads” project involves freediving to create underwater mural reefs. These artificial reefs are intended to help jump start marine growth, potentially becoming thriving reef sites for a multitude of different organisms. Importantly, all materials Yoro employs, including the pigment sticks, are eco-friendly and safe for marine ecosystems. Just a girl and her bear and…friends! Love the duo behind @pipsqueakwashere. If you’ve ever read Philip Pullman’s amazing ‘His Dark Materials’ trilogy beginning with ‘Northern Lights’, the concept of having a deamon, an animal companion that represents your inner-self or soul, is beautiful. This girl and her bear that features throughout their work, reminds me exactly of that. I wouldn’t mind the bear, but I bet mine would be a cat, maybe even a panther! Having been to New Zealand a couple of times, this resonates: @_millo_ has just completed a gorgeous new mural in Whangarei, NZ, titled ‘Hongi – the breath of life’. ’HONGI is the traditional Māori greeting in New Zealand. It is done by pressing one's nose and forehead (at the same time) to another person at an encounter. During the hongi, the “ha”, or breath of life is exchanged and intermingled. The breath of life is also considered the sharing of both parties' souls. Ummm, well for me they do! Kind of love this. Yves Tumor’s track ‘Honesty’ from his album ‘Safe in the Hands of Love’ (2018). It hooks in and I keep wanting to listen to it - sizzling, funky and just a bit trippy. Check it out. Another gorgeous artwork by Seth (@seth_globepainter) titled ‘Cat Walk’, one of his paintings made in an old district of Shanghai. It’s the black cat that I love! ‘make love not war’ mural by Alice Pasquini (@alicepasquini). As part of an end of year round-up, the team at NOWNESS (https://www.nowness.com) has produced a series, ‘12 Days of Performance’, featuring dancers, musicians, and prominent creative individuals, such as Sergei Polunin in this ‘capsule performance’, directed by Bunny Kinney. Simply gorgeous. Whatever you believe in - peace, love, creativity, freedom - here's to celebrating whatever matters most to each of us - and hopefully with the people who matter most - in the coming holidays. With joy. How to get people in inner city areas to connect to climate change and motivate them to act? To not see climate change and its impact on the environment as an issue separate from their lives? Artist Olafur Eliasson has partnered up with scientist Minik Rosing to create the outdoor installation, ‘Ice Watch London’ – currently on display – to address this urgent issue. The installation consists of 24 blocks of free-floating ice originating from the Greenland Ice Sheet, that was freighted and positioned on Bankside, outside the Tate Modern, London. Eliasson’s ‘Ice Watch’ has had previous iterations, first in Copenhagen’s city square in 2014 to coincide with the publication of the UN Intergovernmental Panel on Climate Change’s ‘Fifth Assessment Report on Climate Change’. The Paris version was at the Place du Panthéon in 2015 for the UN Climate Conference COP21. For the London ‘Ice Watch’ Eliasson has partnered with ‘Julie’s Bicycle’ to assess the carbon impact of the project and how best to minimise it if repeated in the future. Fished out of the Nuuk Kangerlua fjord, each block weighs between 1.5 and 6 tonnes. The Greenland Ice Sheet loses thousands of these blocks of ice throughout the year. The ice sheet took millions of years to form, and it’s melting at an accelerating rate due to global warming. Far from the source it’s difficult for people to imagine the melting of the ice sheet, much less the scale at which it’s happening. Eliasson hopes the project will encourage people to connect with the issue not through facts, figures, or watching videos from a distance. He wants people to have direct access to this ancient ice – to feel it, listen to it, taste it, touch it, sense it. To watch it as it melts with the eyes of the heart, mind, and emotions. We are not distinct from climate change, we are part of it.